The title says it all. But for the sake of completeness I’ll go ahead and give my reasoning for why Edge of Tomorrow should have been called The Longest Day. In April 2014 I published an article entitled “10 Movie Poster Mashups.” One of those was a combination of Groundhog Day and The Longest Day. I thought that was pretty clever at the time. Little did I know that two months after that a little movie called Edge of Tomorrow would debut in theaters, and it would have worked even more perfectly on my list than Groundhog Day. Edge of Tomorrow has its own share of names. It is based on the Japanese novel All You Need Is Kill, which was adapted into a manga the same year that Edge of Tomorrow was released. 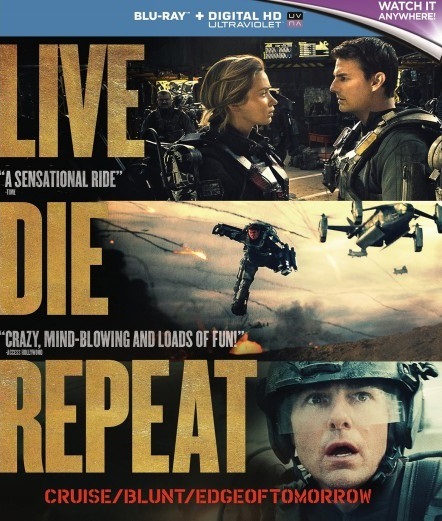 And when Edge of Tomorrow was released on DVD and Blu-Ray, its title appeared to change to Live. Die. Repeat. That’s a lot of name changing, but I really think that it needed just one more. The Longest Day is, of course, the epic 1962 war film about the D-Day invasion of Normandy by the Allied forces attempting to gain a foothold against the Nazi occupation of France. Edge of Tomorrow is basically a reimagining of D-Day in a science-fiction setting where most of Europe (beginning in Germany) has been captured by a seemingly unstoppable alien race. United Defense Force troops launch a massive invasion at Normandy, but they get pinned down on the beach to the point that there’s no way for them to fight their way through the onslaught of alien attacks. It would have been a brilliant double entendre if the filmmakers had called their movie The Longest Day. I love Edge of Tomorrow, and it’s great no matter what it’s called. I just think that one tiny tweak would have made it even more perfect. This entry was posted in Movie Matchups and tagged edge of tomorrow, films, movie review, movie titles, movies, science fiction, war movies. Bookmark the permalink.